Buying a cheap battery may save you money up front, but is almost certain to cost more in the long run. Some novice anglers may think that they can power their trolling motor with an ordinary SLI-type car battery. Trust me, it’s not ideal to use a car battery! 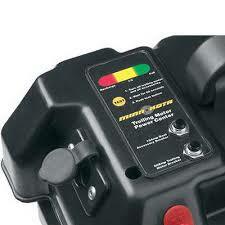 Using car batteries on a trolling motor will only destroy the motor and the battery. Car batteries cannot be recharged and be brought down on water levels over and over again. They’re just not designed with that intended use. If you use car batteries, you may end up buying and installing three or four of them before a quality trolling motor batteries wears out. Marine batteries may also be considered to power a trolling motor. Often times they are less expensive than the leading trolling battery brands or any trolling motor battery for that matter. BUT these are not ideal for high current and large distances. Trolling motor batteries are specifically designed for prolonged, harsh activity. Buying from the most competent brands ensures you spend less time recharging and more time fishing. If that’s what you’re looking for, always choose the right type of battery. 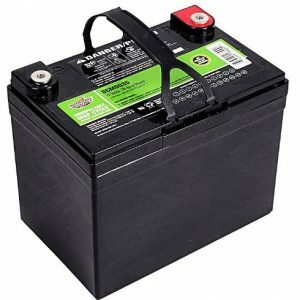 Below is a list of the top rated trolling motor batteries. Each model has its’ own short review, and some even have a longer, full review as well. 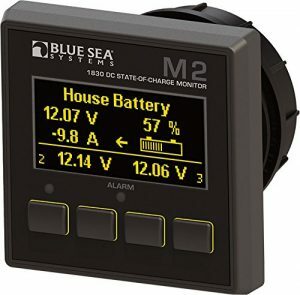 Each offers different power output, so that you can easily find the right battery for your boat size/power needs. This is the undisputed leading brand for trolling motor batteries. Its dimensions are 12.8” x 6. 5” x 9. 4” and it weighs roughly 59 pounds. 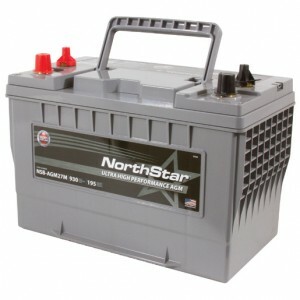 It’s a 12-volt deep cycle battery with 750 cold cranking amps. This blue top battery has a reserve capacity of two hours, ideal for longer periods of trolling. The absorbed glass design provides the battery with mounting flexibility and ease of use. The battery belongs to group 31, with a CCA of 900 and an MCA of 1125A. It operates well in cold climates and extreme weather and packs a powerful punch when starting the engine making it an ideal choice for those in temperate climes. It also promises fifteen times vibration resistance for durability. 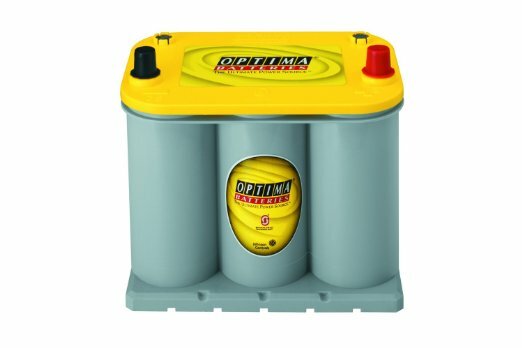 The Optima battery is a dual purpose battery, meaning it can be used both on deep cycle applications or starting applications. Its patented SPIRALCELL technology is an assurance that it has more running time, can be recharged fast, and it has longer life compared to marine batteries or any RV batteries. 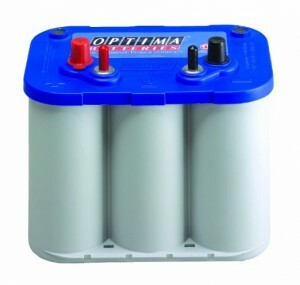 Optima batteries are tightly wounded to minimize plate movement and damages caused by rough conditions. It’s also spill-proof hence it is maintenance free as well as environmentally friendly. Finally, it has low self-discharge rate, which means it can sit for a year without being recharged. 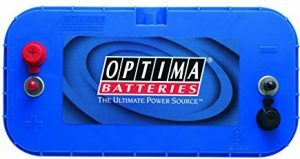 Being a group 31 battery places the Optima D31M in the strongest and most powerful group of batteries manufactured and produced by Optima. The battery has a 2 purpose application for both deep cycling and cranking meaning there is no need for 2 separate batteries. The battery is maintenance and spills There is no need to top up the battery with distilled water and its design allows it to be mounted in many positions without worry. The heavy duty casing makes the battery 15 times more resistant to damage from excessive vibration and the inner workings allow for three times as many recharges than that of other lead batteries of the same class. You need to follow the charging manual to the letter. If the battery is overcharged, there is no way to change the water resulting in a full replacement of the battery being required. When performing a rapid recharge you will need a charger with a maximum of 15.6V and of a constant voltage. If the voltage is not constant it can lead to permanent damage to the battery. 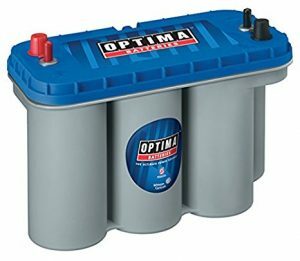 At half the price, this battery is a strong alternative to the Optima battery. From the most favored battery manufacturing company in the US, Interstate, one can expect the best performance. This model is a 12-volt trolling motor battery with a 35 Amp hour. Its dimensions are 7.68” x 6. 14” x 6.14” and it weighs roughly 23.1lbs. The compact nature of the DCM0035 makes it an ideal choice for smaller vessels in need of consistent and reliable power. It has robust plates that add to an extended life. The grid design is computer-generated which is why it can provide optimum high-power density. 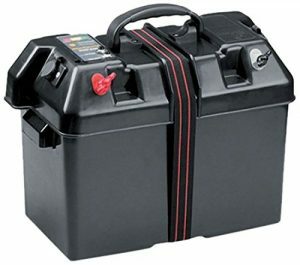 Unlike other wet acid batteries, it is sealed to prevent leaks and spills making it easy to mount at various angles without worry. The AGM technology helps bind the batteries cells together and contains the electrolytes, therefore, making it spill proof. The SCM0035 is an easy to install, zero maintenance battery that is perfect for rough trolling. Lightweight and compact design makes it easy to carry and install the battery on the boat. AGM technology takes the worry of spills and leaks away. Zero maintenance required (No need to top up the distilled water). Provides between to 4- 5 hours of consistent power before needing to be recharged. Not suitable for use on medium and large boats. 12V 35 Amps per hour is not enough for consistent high power use. It doesn’t have the same SPIRALCELL technology that the Optima battery technology has, which means it can be prone to damages caused by vibrations. 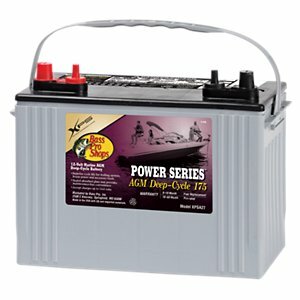 The Bass Pro XPS is an AGM battery that is both spill and leak proof thanks to the AGMs cell binding properties. 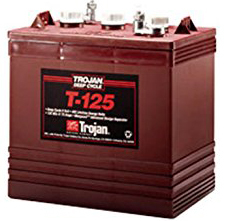 This is a marine battery, which means it is less expensive compared to the two batteries listed above. 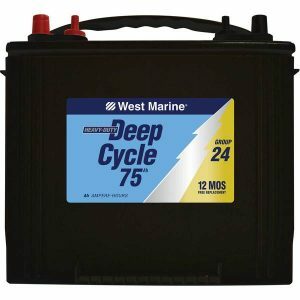 It’s a 12-volt deep cycle battery that promises longer and trouble-free time on the water. The compact nature of the XPS 12V makes it an ideal choice for smaller boats requiring good power output. For larger boats the next size up can provide sufficient power output should the 240 model not suffice. Has plenty of reserve power. Free ship to store and a $10 voucher for purchases over $35. Quite heavy for its dimensions compared to other modern batteries. Price is possibly not suitable for those on a very low budget. Note: As mentioned earlier, marine batteries may not charge as quickly as its counterparts designed specifically for trolling motors. Remember to buy a battery that can last for a longer time. Sometimes though, it is the manner of how you look after the battery product that makes it last longer and perform stronger. 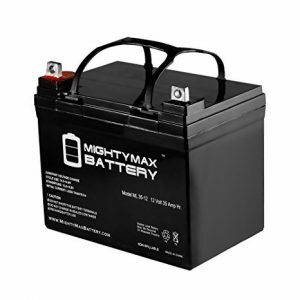 The Mighty Max is a 12V 35Ah Sealed Lead Acid battery that is rechargeable and maintenance free. It measures in at 7.68 x 5.16 x 7.13 inches and it weighs roughly 23.15 lbs. It is designed to handle deep discharges and a broad range of temperatures. It does not come with a wire harness or mounting accessories, but it can be mounted in any position. The design of the battery makes for easy charging and it is both shock and vibration resistant much like the Optima battery.The heavy duty calcium alloy grid performs excellently with both float and cyclic applications. The AGM helps keep the electrolytes in place inside the battery during trolling and helps give it a longer life. With this battery you will receive a 30-day full refund and a full 1-year warranty. Most people never have issues with this affordable battery and it holds a 4.3-star rating to prove its reliability on trolling motor boats. 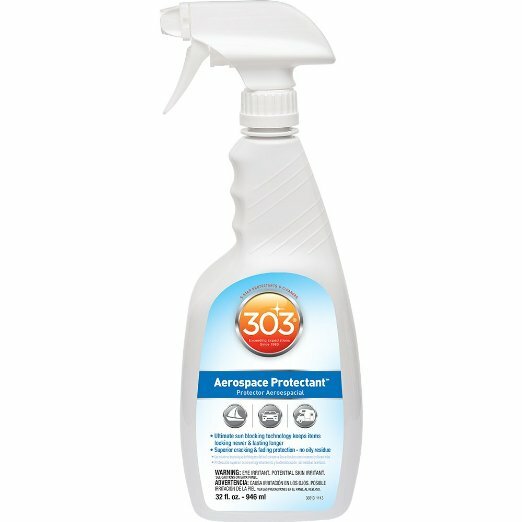 Can last for up to 3 hours continuous use on smaller vessels. Can be used in both high and low temperatures. The sealed unit prevents spills and leaks. Heavy for its size when compared to other modern batteries. The package doesn’t include any mounting or harness accessories. 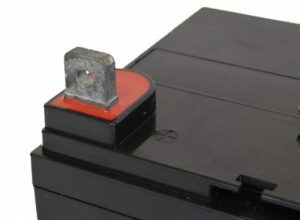 The AGM is placed between the specially formulated plates inside the battery and absorbs the electrolytes creating a safe and spill free battery. 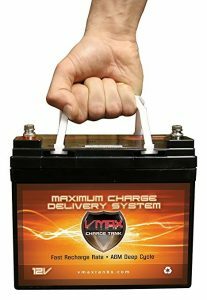 This battery is designed to provide up to 4 hours power for a 40 lb motor and up to 9 hours power for an 18 lb motor. It is built with heavy duty lead tin alloys to ensure high performance and extended service life, even after repeated discharges. As with all of the previous reviews, the battery is maintenance free and will not require distilled water to be topped up. 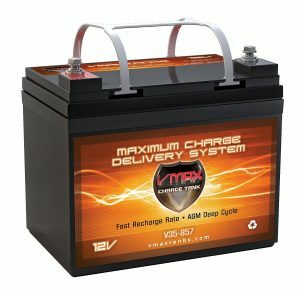 This battery is also able to recharge quickly, especially if you use the recommended VMAX 3.3amp charger. It measures in at 7.7 x 5 x 6.1 inches and 25 pounds. Lasts for up to 9 hours continuous use on smaller motors. Modern technology and easy mounting. Does not hold a charge for as long as other above. 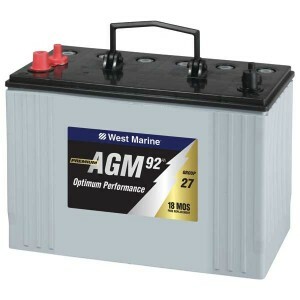 The Marine Group 24 battery is a deep cycle lead-calcium flooded marine battery. Its dimensions are 10.75” x 6.75” x 9.1” and it weighs roughly 45 lbs. The sealed unit allows the battery to be mounted up to a 45-degree angle without the need to worry about spills and leaks. Perfect for cold weather cranking. Well designed unit and easy to carry. Very heavy when compared to lithium batteries of the same size. Does not hold a charge for long compared to others. Quite expensive for a flooded battery. 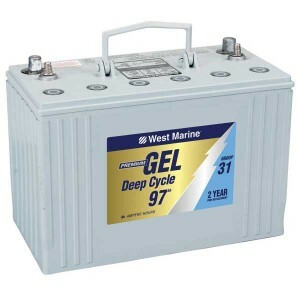 The Marine Group 31 battery is a deep cycle lead-calcium flooded marine battery that is more powerful version of the group 24 battery above. Its dimensions are 13” x 6.75” x 9.5” and it weighs in at 60 lbs. As with the smaller version, the sealed unit allows the battery to be mounted up to a 45-degree angle without the need to worry about spills and leaks. Molded-in stainless steel studs and hex nuts help create a fluid connection and prevent corrosion to the exterior power joints. The group 31 battery is a better fit for large boats and is ideally suited for use in colder temperate climes. Extended power for larger boats. High Amp hours gives it plenty of ongoing power. Very heavy for its size. Not ideal for small boats with limited load capacity. Expensive for a flooded battery. This is perfect for use in small vessels that do not have a battery compartment. It features simple access to battery terminals that are used to connect power cables. The power centre features a charge indicator letting you know the current charge of the battery at any given time. The power centre is lightweight and compact enough for easy use on the smallest of boats and can fit size 24 and size 27 batteries in it. The case makes it easy to transport from location to location and it is surprisingly resilient considering how little it actually weighs and helps keep the batter safe. 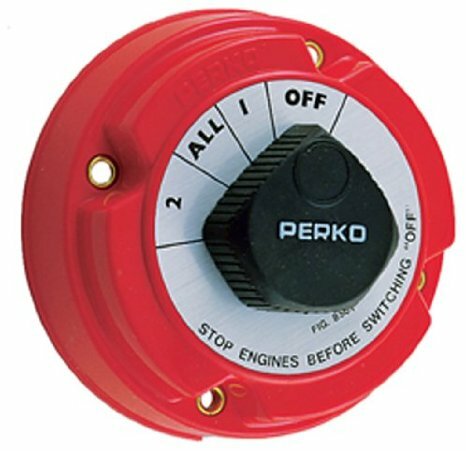 Built in circuit breakers improve the safety of the unit. 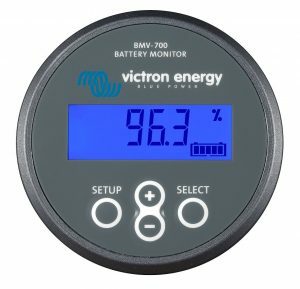 Charge indicator lets you actively monitor the remaining power. All in one unit for emergency power backup. Battery is not included with the case. The Thrust of the Motor: A larger boat will obviously require more thrust, therefore a larger battery will be needed. The Fishing Conditions and the Fishing Style You Prefer. Vibration Resistance: especially if you frequently go out in choppy water. Ideally, the best deep cycle trolling motor battery can last up to six years, as long as it’s not run completely dry repeatedly. You may not think about your boat’s size, shape, or accessories when you first realize that you need to replace your battery, but it is very important that you do. Most people have a battery for their trolling motor and one for all other marine applications. A larger boat will need a larger motor to provide it with enough trust to move forward at a speed that is functional. If you want to go faster, you will need even more thrust. This thrust will need more power behind it. Thus, a larger battery size will be required if you want it to function properly. If your boat is heavier, it will also change the size of battery that you need. A heavier boat will need more to push it ahead. If either your motor or your battery falls short in any way, your boat will not be all that you wanted for it to be. It will be sluggish in the water and may cause you to waste most of your day out fishing; riding to a new spot. Each boat will have its own unique power needs. Boats may leave the factory with the same battery size, but what it needs after you add accessories, requirements will change. For instance, if you have a pontoon boat, there are several accessories that you many boaters will might add. Each of those accessories require more power. You may even end up with enough add-ons that you need to carry two or three batteries. The same may be true for console boats, which may have a larger, more powerful motor and more accessories from the factory. A kayak typically does not have any accessories, but you may want to add on a small trolling motor, which means you need minimal power from your battery. In this case you will be able to get away with a smaller, more cost-effective choice. 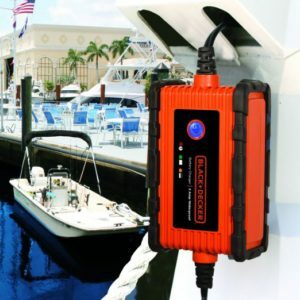 If you do not choose a battery size that can handle your GPS, aeration system, radios, flood lights, and other accessories, you will end up draining your battery each time you go out on the water. This will shorten the lifespan of your battery and may even cause you to end up stranded on the water, in a boat that has a dead battery, wishing you had a way back to shore. One of the most important things to note when looking to buy a trolling battery is that the bigger the boat is, the more thrust it will require and the larger the trolling motor will need to be. A larger trolling motor will require more power; therefore you will need a larger battery. In technical terms, thrust is the force of flight that pushes things forwards and can be created by both engines and propellers. Propellers work by rotating and causing a difference in air pressure, therefore, moving the vehicle forward, whereas an engine will use fuel combustion to create the difference and perpetuate the forward motion. Thrust is typically measured in pounds (lbs) and will give you an idea of how powerful a motor is, the more powerful the motor the more battery power it is going to require. Unless you enjoy being slowed down by tides, friction and adverse weather conditions, the last thing you want is to have too little thrust. A good way to look at it is to imagine a child trying to swim against a strong current in the sea, no matter how hard they try they find it hard to move forwards and use a lot of energy in doing so. Now imagine an athletic adult in the same position, they have a larger body with a more developed physique and therefore swim against the tide with ease. The thrust of your boat is equally as important and makes the difference between a sluggish and difficult journey and a smooth and enjoyable one. The weather can directly affect the amount of thrust required. Of course, the weather can also work to your advantage at times, but more often than not this is not the case. If you tend to spend most of your time fishing on a lake that is as flat as a millpond, then a smaller motor will usually do the trick. However, if you intend to use your boat on waterways and at sea, then a smaller motor most likely won’t provide you with the power you need. 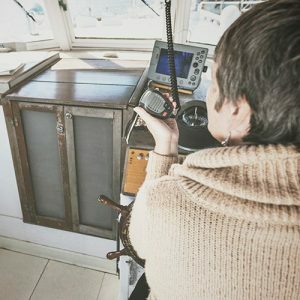 Windy weather conditions can affect every type of boat in different ways. 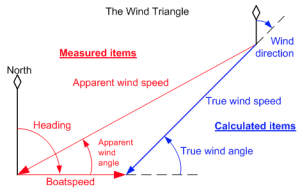 A lot of how much wind can affect thrust depends on the surface area of the vessel, therefore, it can be assumed that the larger the boat is, the more wind is going to affect its performance. If you have ever walked into a strong wind you will have experience of the uphill struggle it can be to make your way forwards, and this is the same for a boat. A smaller trolling motor and battery will give you less power and control and make manoeuvring the vessel much more of a challenge. For many this is one of the most important considerations. The length of time a battery will produce power for depends on its size. The larger the rating, the more power it can hold. There are 2 things to look at to work out how long a battery will last, these are the ‘Amperage Hour Rating’ and the ‘Motor Amperage Draw’. A 100 amperage battery that provides 10amps of power per hour would provide 10 hours of power, whereas if it provided 25 amps per hour you would get 4 hours of power from it before it runs out. The best way to look at the amperage of a battery is to compare it to the fuel tank of a motor vehicle. The larger the fuel tank is, the more fuel it is able to store and the more energy it can provide to the engine. The motor amperage draw refers to how much power a motor consumes at any given speed. Finding out the motor amperage draw can be difficult at the best of times, although the manufacturer instructions or website should tell you this. To get a good idea of how long a battery will last you simply take the amperage hour rating and divide it by the motor amperage draw. As an example, a 100 amp battery being used on a vessel that pulls 16 amps at a medium speed would provide you with 6 hours and 15 minutes of power. A 100 amp battery being used by a motor that pulls 25 amps at a medium speed would last 4 hours. How Long Does a Battery Take to Recharge? Several factors will come into play when trying to work out how long a battery will take to charge. These are; how much power the battery has remaining, they type of battery, the age of the battery, the condition of discharge, and the type of charger used. 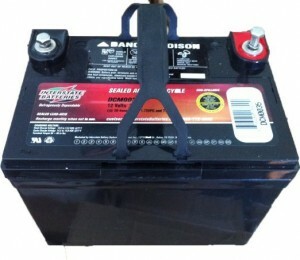 For the purpose of simplicity, we will assume that a 200 Amp battery is fully depleted and is need of a charge. The charger provides the battery with 10 Amps per hour; therefore, it will take roughly 20 hours to fully charge the battery. (200/10 = 20.) Of course, this will largely depend on your charger too as many automatic chargers will reduce the current as the charge time progresses thus leading to a longer charge time. It is important to note that it is recommended to slow charge deep cycle batteries to enable them to have a longer shelf life. The warranty provided for your trolling battery will be determined by how and where you purchased it, and whether it was new or second hand. As a general rule of thumb, the majority of providers issue a 5-year warranty with most trolling batteries. This can, of course, be longer or shorter and can be found on the website of the manufacturer. Again, the price of a trolling battery will depend on its size, model and manufacturer. 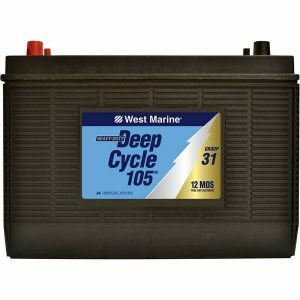 Cheap marine batteries start from around $50 and can go up to more than $2000 for a high-end model. 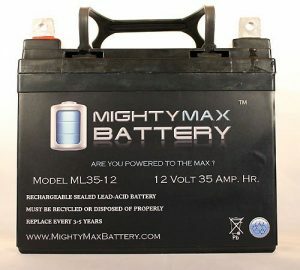 The price will also depend on the type of battery it actually is and can vary between gel, lithium, flooded, and AGM batteries. 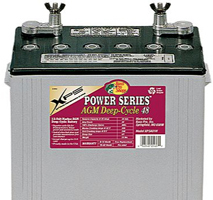 A flooded battery is also known as a wet cell deep cycle battery. Using lead plates separated by spacers and immersed in a solution of sulphuric acid and distilled water, the heat generated is dissipated through conduction with the water. The down side to flooded batteries is the need for maintenance and topping up of the water, which if left low can lead to the overheating and warping of the plates, they are also prone to leakage and spillage from excessive vibration. The upside is that flooded motors are designed to be used with trolling motors and prove to be an economical option. Each battery type has its own pros and cons, so it is not a one size fits all type of choice. For those on a budget, an AGM battery will prove to be best as it provides power, longevity and functionality at a fraction of the cost of a lithium-ion battery. For those who have a generous budget, a lithium-ion battery will prove to be better due to its extended lifespan, lack of maintenance and fuel saving benefits from a reduce weight load. Installing a battery to the trolling motor can seem like a daunting prospect, however, it is actually a straightforward process that requires just a little knowledge and skill. Below is a guide for a single 12V motor. Ensure all switched are in the off position before starting the installation. Connect the red lead from the motor to the (+) positive terminal using a 50AMP breaker. Connect the black lead to the (-) negative terminal on the battery. Connect the red lead from the motor to the (+) positive battery terminal on battery one. Connect the black lead to the (-) negative terminal on the battery terminal on battery two. Use a jumper wire and connect it to the (+) positive on battery two and to the (-) negative on battery one thus completing the circuit. It is important to use a jumper wire with the same gauge as the motor wires. Connect the (+) terminal on battery three to the (-) negative terminal on battery two. Connect the (-) negative terminal on battery one to the (+) terminal on battery two. *use a circuit breaker of 40AMPS for motors with eighty-one lbs or less of thrust and a breaker of 50AMPS for motors with more than eighty-one lbs. Allow sufficient cool off time between charging the battery and using it. This is important as it allows the heat created by the charging to dissipate and prevents the battery from overheating. Deep cycle charge batteries should be charged as quickly as possible after use as leaving them at a discharged position causes deterioration of the batteries internal structure and difficulty with the battery holding charge. Regular cleaning should be performed to remove any dirt, grime, overspill and moisture from the top of the battery to prevent corrosion of the battery terminals. This should also be performed on any connecting cables, connectors, and terminals. Before putting on charge, always check the level of the electrolytes and that they are below the level of the splash barrel of the split ring. If the water levels in the battery are low, top them up using either distilled or deionized water only. Never use bottled or tap water as this will destroy the battery. Why Use a Dedicated Trolling Motor Battery? Using a trolling motor battery exclusively for the trolling motor instead of using the main battery of the boat has several upsides to it. Since trolling motors are much smaller than traditional engine motors they require less power to get them started and to keep them running. Using a dedicated battery for the trolling motor also allows you to use the main battery on the boat for powering other electronics such as sonar, lights, and radio communications with less interference. As you will be powering the trolling motor from its own power source, this allows the main running’s of the boat to be covered for longer via the main boat battery. Trolling batteries are also designed to give more thrust with bursts of higher power when needed. The main battery of the boat should also be reserved for cranking and is designed to start with low amperage. 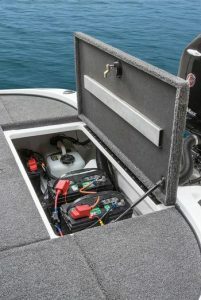 As the battery for the trolling motor will require regular discharge and recharge when compared with the main boat battery it allows the main boat battery to last longer.